Keeping a beautiful fish tank is now a favorable pet trend among many people. No mess, not much effort and pretty, it is understandable that more and more people are into keeping pet fish. And the current technology makes it very simple and easy for pet keepers to set up a comfortable and beautiful fish tank that is not only beautiful but is also a comfortable and healthy environment for the fish. Besides all the decorations, the two most important factors of a fish tank are water and lighting. Water, especially freshwater is not difficult to find and there is no need for modification. However, it is not as simple with lighting. Since the majority of the fish tanks are kept indoor and in closed rooms where there are not much natural sunlight, for the best health benefit for the fish, a source of lighting should be installed over or near the fish tank to further support the lighting for the fish. One of the highest rated aquarium light is the Beamswork EA Timer FSPEC LED Aquarium Light Freshwater Plant. The following review will explain in more details about this product. The light has a sleek and contemporary design that makes itself looks neat and cool, so you do not have to worry about the design of the light ruining the meticulous design you put efforts into creating for the whole tank overall. 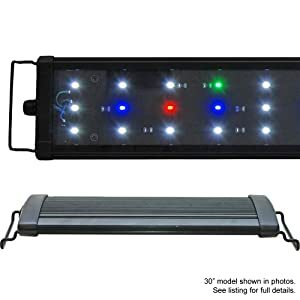 This light comes in multiple different size options with the smallest being 18 inches in length and the biggest is 72 inches in length. The light is reasonably wide with about 5.2 inches in width. With such size, the light is effectively lightening enough for a tank vaguely around the similar size with the light. With a bigger tank, you should consider mix-match two or more lights at once to make sure the whole tank is covered with enough light. Staying indoor with daily life normal lighting is not enough for fish and water plants inside the tank since the room lights are actually much different from natural sunlight. In order for the fish to live healthily and the water plants can grow, the lighting of the tank needs to be able to mimic as closely as possible to the natural sunlight, that means the light needs to be a combination of a full spectrum of light waves. This product qualifies that requirement. This fixture is pre-installed with 10000K, Actinic 460nm, Red 620nm, and Green 520nm spectrum LED light. Turning all the spectrums on will allow a full spectrum lighting that helps both the fish and the water plants being healthy. Compared to the old school fluorescent light bulbs, LED lights are up to 90% more energy efficient. Their lifespan is supposed to be longer compared to fluorescent bulbs as well, hence you don’t need to change the light bulbs as often. So using LED lights help you save energy while doing good for the environment. There are two modes of operation in this lighting: daylight and moonlight mode. The daylight mode allows full power and full spectrum being turned on so the lights are bright as natural lighting as possible. The moonlight mode is still on full power and full spectrum similarly to the daylight mode, however, the light is overall turned on dimmer lighting mode. These two modes especially helpful for water plants when some of them need a clear distinction between nights and days to grow most efficiently. Furthermore, for ease of use, this fixture is pre-wired to be used with an optional timer module so you do not have to manually switch between modes every day. However, these timer modules are sold separately. You have to pay extra to get the extra very convenient timer module. Power supply or the adapter is compatible with 110V to 220V power source. Users outside of North America may need an adapter for the fixture to properly function. Yet, even users in North America needs to be careful since the adapter comes in 24W, which is a bit lower than general electricity. This problem, even though not very dangerous, can make the adapter turns very hot and shortens the adapter lifespan. 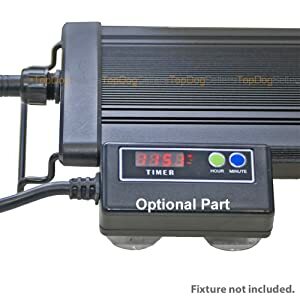 If you are into simple, straightforward and functional aquarium lighting, this Beamswork EA Timer FSPEC LED Aquarium Light Freshwater Plant is for you. Even though it does not have many extra fancy functions, modes or ability to combine different spectrum together, it serves the exact purpose of an ideal aquarium light, all pre-installed and requires no extra setup from users. There is almost no way to go wrong with the lighting modes of this fixture.